Mycozil is an all-natural product developed to support the natural cleansing of yeast and fungal organism from your body, such as Candida. Mycozil claims to promote internal harmony by keeping ‘rowdy organisms’ in check. Mycozil is a gluten and GMO free product as well as vegan. It is made in the USA and was not tested on animals. It comes in a UV-protectant glass bottle with a bold label, but is it more than fancy packaging? I looked further into Mycozil to find out. Jatoba (bark) a rain forest tree, the bark is thought to be an effective topical application for fungal problems. Wild Crafter Brazilian pepper tree (bark) the bark contains active compounds which may offer support by inhibiting fungal cell wall formation. Organic Pau D’Arco (bark) a herb found in the Amazon rain forest, and has been used against harmful organisms and fungus for centuries. Oregano Anise Seed, this is very potent against harmful organisms. Beta-Glucanase (enzyme) this breaks down bonds within beta-glucan. These glucans comprise most of the cell wall of many fungal organisms such as Candida. Hemi-Cellulase (enzyme) this breaks down hemicellulose which may help against Candida. It also includes organic gum acacia and kosher vegetarian capsules. Each bottle contains 120 vegetable capsules and the website prescribes three capsule two times daily before meals (or as recommended by your healthcare provider). By this dosage, a bottle of Mycozil would last just 20 days. The website reports that customers would see signs of satisfaction after one month and significant changes after five to six months. 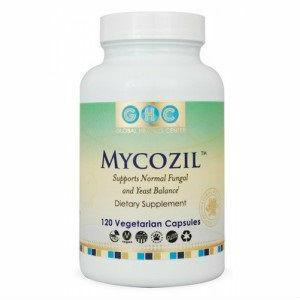 One bottle of Mycozil normal costs $44.95 but at the moment the website is offering a special price of $39.95. At this price it would cost $239.70 for a six month supply. Currently, due to high demand, Mycozil is out of stock but you can contact the website directly if you would like to be notified when it comes back into stock. The website contained four written reviews, all of which were complementary and claimed that it had made a difference, though one reviewer claimed it made them feel drowsy. The website also has a strong returns policy, guaranteeing returns up to 180 days from purchase. Mycozil seems to be a well reviewed and received product. The dosage is quite high with six capsules per day for anywhere between four and six months. The price is also quite high, at $239.70 for a six month course. Jack Stevens	reviewed Mycozil	on November 16th	 and gave it a rating of 2.5.